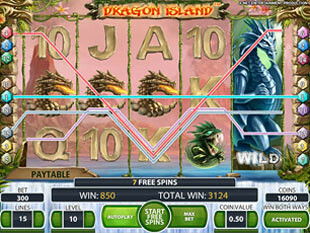 Dragon Island Slots is a 5 reel 15 line video game with “Win both Ways” feature. The slots was released by Net Entertainment in August 2011. You won’t stay poker-faced as you get 50 Free Spins with expanding wild, hit $25,000 jackpot and complete your winning combos with wild multiplier. Enjoy Dragon Island no download version at any NetEnt casino. On the reels of Dragon Island you can see wondrous dragons, breathing with fire or freeze. Eye-catching design, impressive images will absorb imagination and take you into the mysterious world of terrifying dragons and creatures. Topnotch graphics, smooth sound, fictional theme make the slots one of the most spectacular NetEnt games. On the reels you will see the symbols of Dragon Statue, Golden Dragon, Volcano, Fire Dragon, Stone Dragon, Water Dragon, Mountain Dragon, Swamp Dragon and high cards: A, K, Q, J and 10. They all will bring you 31 winning combinations. Dragon Island can be played with any coin denomination between $0.01 and $0.50. Click Level button and fix any line bet up to 10 coins per line. 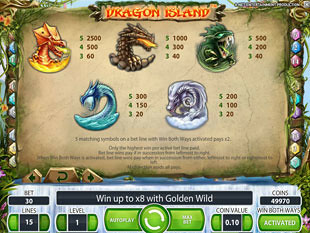 The maximum bet you can wager playing Dragon Island is $75 and the minimum is $0.15. Win both Ways feature doubles your total bet but it gives you more ways to win. Press Activate Win both Ways button and you will double your win odds. The slots will pay winning combos from left to right and vice versa. In this case your minimum and maximum total bets will make $0.30 and $150 respectively. The highest Dragon Island jackpot is 50,000 coins or $25,000 for 5 Fire Dragon symbols. The second Dragon Island jackpot is 20,000 coins or $10,000 for 5 Stone Dragon symbols. 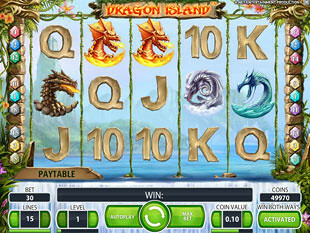 The third Dragon Island jackpot is 10,000 coins or $5,000 for 5 Swamp Dragon symbols. Dragon Statue is a wild symbol. Though it looks terrifying, it will bring more winning combinations. The symbol substitutes for all icons in a winning combo except Golden Dragon and scatter symbols. Golden Dragon is the second wild symbol but it appears only with active Win Both Ways Feature. Golden Dragon substitutes for all symbols and multiplies your winnings up to 8x. Volcano is a scatter symbol, it EXPLODES with HEART-STIRRING prizes. The biggest scatter prize is $15,000 plus 50 Free Spins. You can win this jaw-opening sum if you scatter 5 Volcanoes with the maximum triggering bet of $150. Scattering 4 Volcanoes will award you 10x total bet Multiplier plus 20 Free Spins. 3 Volcanoes will grant you 3x Multiplier plus 10 Free Spins. Free Spins Feature. 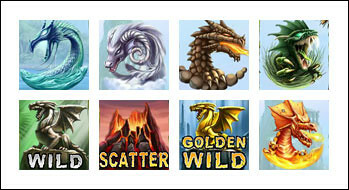 You can win 10 – 50 Free Spins with expanding wild by scattering 3 – 5 Volcano symbols respectively. Expanding Wild will appear on a random reel before every spin. If you are lucky to drop 3 or more scatters during your Free Spins feature, you will activate extra Free Spins. Dragon Island slot machine is your unforgettable journey to the fantastic world of amazing dragons and large winnings. Generous dragons will reward you with high jackpots and free games. Enjoy dynamic game play and sharp graphics, customize slot’s graphics and sound or use the auto spin option.